As a dental surgeon, I’m always looking for the next big thing combining skincare and science – and I think I’ve found it. 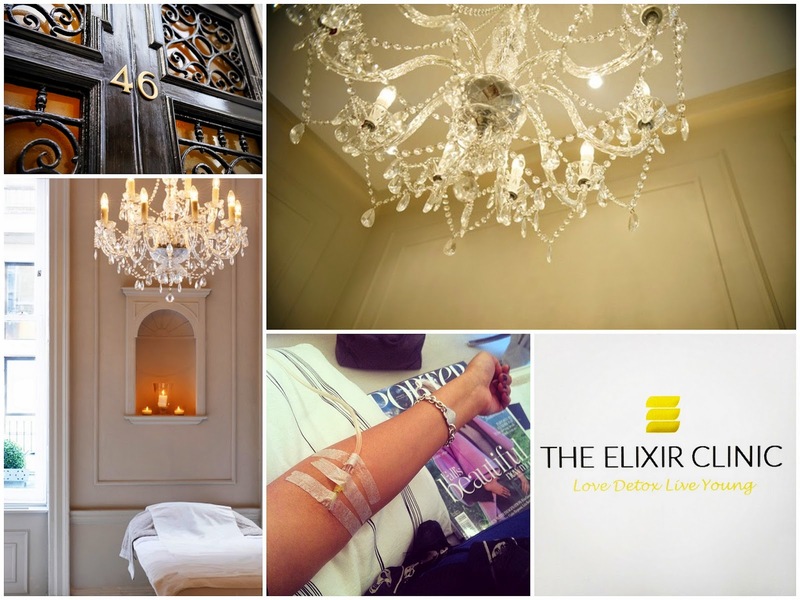 A few weeks ago I made my way to The Elixir Clinic on Wimpole Street for an exciting new beauty treatment that I’m pretty certain is going to take the beauty world by storm. They’ve already appeared in Tatler and I'm sure it’s not long before they pop up in other publications. The Elixir Clinic is a luxurious beauty and anti-aging clinic specializing in holistic health and offering IV (intravenous) Infusions that deliver the perfect amount of vitamins and minerals straight to your bloodstream. So why do I think that everyone needs to try this? Most people do not get the right quantity of nutrients their body needs to function properly, perhaps because we don’t eat the correct foods, we have natural deficiencies or other lifestyle reasons. The multivitamin tablets that we take once or even twice a day don’t cut it – our body only absorbs 0-10% of what’s actually contained in the supplement. The rest is wasted. With these IV infusions, 100% of the nutrients are absorbed. The concept of administering nutrients by IV delivery was originally developed in the 1970s by Dr Myers to help treat a wide range of health conditions. It was used to treat illnesses such as cancer and Lyme disease. They then gained popularity with athletes looking to boost their performance, and now the treatment is being offered to us all, to help overcome a plethora of concerns. I opted for the VIP Elixir infusion, which is a custom blend of all the infusions tailored to individual needs. It contained a blend of vitamin C, collagen, magnesium, zinc, selenium, calcium gluconate, vitamin B12, B6, B Complex (B1, B2), B5 and biotin (given intramuscularly). All of these vitamins and minerals combined enhance luminosity of the skin, improve hair growth, increase energy, reduce fatigue, boost the immune system and detoxify the body. The actual infusion lasted 45 minutes. I was talked through the process beforehand, a thorough medical history was carried out and vital signs were monitored. The insertion of the cannula wasn’t at all painful and those 45 minutes were pretty blissful to be honest! I caught up on my Porter magazine reading and the magnesium in the infusion causes a relaxed sensation to the body as it’s a muscle relaxant. Immediately after the treatment I felt rejuvenated and rested. The days following the treatment, I had a lot more energy and my skin looked so much more radiant and luminous. These IV vitamin drips are a fantastic concept and can help so many people with a number of different health concerns. The price of one infusion ranges between £180-400, depending on which one you choose, although there are package deals available. It’s recommended that you have an infusion every month or two, or whenever you feel you need a pick-me-up. I’d highly recommend these treatments and I will undoubtedly be going back for more. You can read more about The Elixir Clinic and the different infusions they offer at www.theelixirclinic.com.